To what extent is the EU capable of protecting its citizens and to what extent are they, in fact, citizens of the EU instead of the member states? Which issues the EU can rule upon and which not, should there be more or less EU? Those were the questions that roamed in my head while I participated in the first online dialogue with European Commission Vice President Viviane Reding together with four bloggers. The one-hour long conversation on Google+ was a continuation of the 40 dialogues Ms Reding held in the member states with citizens who wanted to share their problems with her. Such a dialogue took place also in Sofia, but in Triest, too, for the citizens of several member states from the region. 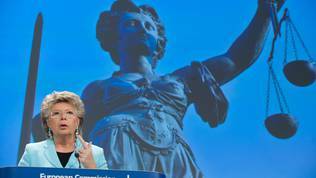 And as Viviane Reding is responsible for important areas like justice, rule of law, fundamental rights, the topics we discussed on January 7th in the evening circulated around these things with a focus on data protection and the freedom on the Internet. 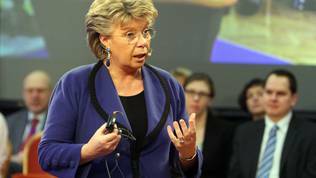 Viviane Reding acknowledged that during all of her dialogues with citizens in the past years, the people told her "do something" without being interested in whether she can or cannot do anything to solve their problems. For instance, she recalled that her dialogue with Bulgarian citizens was quite heated. "There was a lot of shouting, there was a lot of crying, there was a lot of asking the Commission to intervene and in the end, I got from people the answers that, yes, we need our politicians to listen to us as you do", Reding said. She voiced her concern with what has been happening with the freedom of press and mostly with the mainstream media. "Some governments try to exercise absolute control which is against all rules on which our society is based, the rules of the freedom of the press and the freedom to access information. But you see, it is not easy to make the transition from a dictatorship to a democracy. You cannot learn that in some weeks or in some months. You need a little time to do that". But what can the European Commission do? There is a big difference between the candidate countries and the EU member states. The Union has measures to exert pressure on the candidates to make them ensure human rights, the right of expression, the independence of the judiciary and to apply them strictly. Once having become a member, though, the EU finds it very difficult to force a country to implement reforms, the vice president admitted. That is why the Cooperation and Verification Mechanism (CVM) for Bulgaria and Romania was kept alive. But those are not the only counties that demonstrate flaws. She also mentioned Hungary. And in the context of deteriorated media environment, Viviane Reding cited the example of the British daily The Guardian: "Ministers of foreign affairs, for example, always raise their voice when something is going on in the eastern countries but when the computers of the Guardian are seized and when a journalist is held hostage, they do not say a thing. And I believe that is absolutely wrong. We should have the same rules, the same mechanisms applying everywhere, also in the non-eastern countries". The Commission is intensely working on a common European rule of law mechanism, as this website wrote. It is almost ready, Ms Reding announced, and will be presented in the spring, before the end of the European Parliament's term. In September, she presented a document for deliberations in which she proposed several options. The option the Commission has chosen is a mechanism based on the current treaties. "In order to have a really strong rule of law mechanism, we would need to change the treaties, but we do not want to wait until a treaty change, we want to make a proposal which could work under the Lisbon treaty of today", she explained. To what extent will this do the necessary job is a highly disputable question, given that the proposal is yet to be debated in the European Parliament, which means after the European elections. Long negotiations are to be held in the Council as well. Against the backdrop of the ongoing discussion pro or against more Europe, such a mechanism could meet very strong resistance. But it would be of great importance for countries like Bulgaria which still have a great need of external interventions. During the debate on Tuesday I explained that the integration process to the EU has a great transformative power. With the advance into the membership, however, this power fades, which Ms Reding acknowledged saying that there are not many tools the EU could use to demand reforms from an already member of the EU. According to her, politicians have to regularly hold dialogues with their citizens and to work for openness. However, this is a system that needs to be learnt. Besides, this is a system that comes from bottom-up. It cannot be imposed the other way round. New technologies can also significantly contribute for the exchange of information beyond the traditional communication channels, the European Commission vice president added. Another broadly discussed topic was the protection of data and of whistle-blowers. Thanks to the scandal with the revelation of government information by Edward Snowden, new life was brought to Viviane Reding's package for reform of the European data protection legislation. She, though, was unable to commit to a forecast whether the US would agree to introduce reciprocity as she demanded when data protection abuses were treated. Currently, every American citizen in Europe can turn to a court if their rights were violated. This, however, is not valid for Europeans in the US. So far Washington has refused to amend its legislation because Congress did not want to change it. After a visit in the US, however, Viviane Reding said she noted greater openness which became possible precisely thanks to the "Snowden" case. And that case raised another crucial issue - the protection of whistle-blowers. Edward Snowden did not get asylum in any of the EU member states, but in .... Russia. 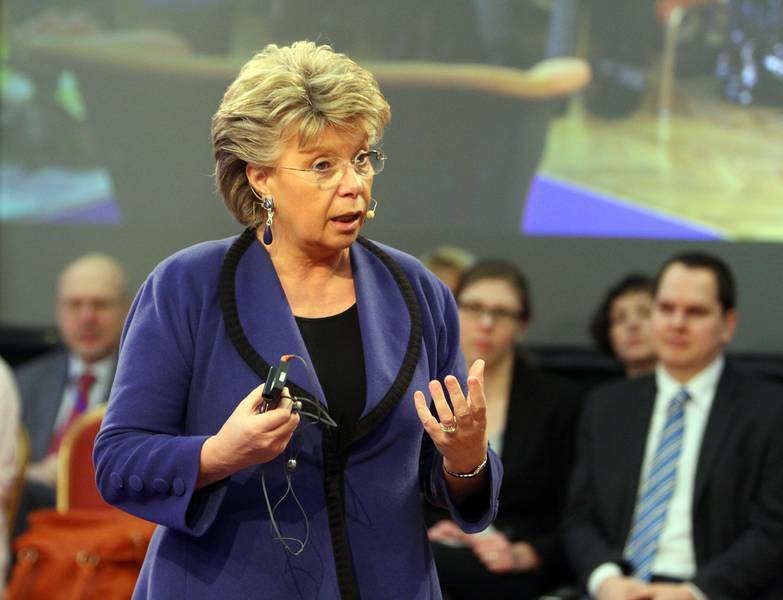 Viviane Reding commented that she thanked Snowden. However, this cannot be done at EU level because the protection of whistle-blowers is entirely a national competence. Without protection of the citizens' personal lives there cannot exist an Internet world. "According to the European law, the freedom of Internet stops where the freedom of the individual is harmed". At this stage, there are not many things the Commission can do. It has tabled its proposals, the European Parliament has also done its job, but the problem arises when it comes to the member states, added Viviane Reding. And we are not talking about a small problem. If we go back to Bulgaria's example, the amendments to the penal code envisage a significant restriction of rights, freedom and access to information. The European Commission has insisted for many years in its CVM reports on a repair of the penal code. In the new penal Code, which is still being debated, envisages prison for every official who disseminates information during their work. Bulgarian media and experts have commented that this would practically put an end to the anti-corruption media investigations and will affect the overall informing of society. Such a penal code is possible precisely thanks to the lack of a European competence on this issue. But the problem is that there are countries that have a good democratic history and do not need Brussels to tell then what their laws need to be like. And that is the reason why the discussion on legislation like data protection is so hard. There is another contradiction, too. On the one hand the EU says that the protection of whistle-blowers is a matter of national competence, while in the same time it demands it from the candidate countries which can be seen in every progress report on those who want European membership. There are specific recommendations to protect whistle-blowers as a leading instrument to fight corruption. 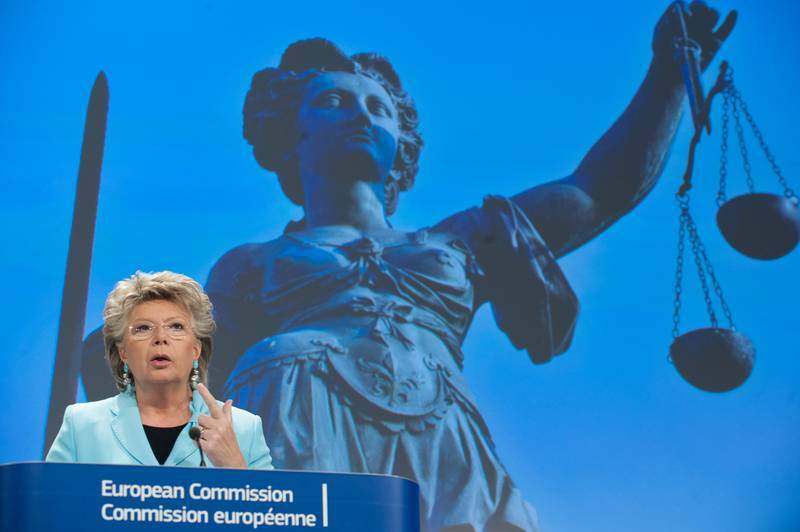 Viviane Reding used her dialogue with the bloggers to send a sharp message of criticism to the British political elite. On the occasion of Mike Smithson's remarks, a former political journalist with the BBC and currently an owner of a website on political betting, that the issue of data protection is not at all a major one in UK, Viviane Reding said that the UK's government puts on its agenda issues like the danger of an invasion of Bulgarians and Romanians because it does not want to make people talk about real issues. She believes that this is a very populistic story because data show that people who go to the UK go there for work, not to steal social benefits. They contribute to taxes and social welfare. The abuses with social benefits are much more due to national citizens than to foreigners. Viviane Reding also recalled that the member states are those responsible for their welfare systems. So they should make sure there are no abuses with benefits. "I am mostly frustrated by the political leaders because what is a political leadership if you just try with populistic movements and populistic speech to gain votes. You are destroying the future of your people actually and that is what I'm really worried upon", Viviane Reding added. She said that bloggers had a huge responsibility to present the truth to their audiences. This, in itself, raises the question of confidence in mainstream media and their agendas. Alas, one hour was not enough to discuss all the issues I myself were interested in, but everyone has a chance to ask their question. On January 16th, another online debate will take place and you can be one of the participants. The only thing you need to do is to follow the hashtags #eudeb8 and #askReding on Twitter. You can be selected as one of the citizens who will ask the European Commission vice president questions online. What I realised in the past months is that if national politicians do not listen, the Commission does. And it listens carefully. She is a liar. Now the EU is trying to make all countries&apos; governments look bad so that the citizens only trust the EU leaders to vote for more Europe so that they can put in place their dictatorship. All they do is against countries. When they talk about a European Union, it is only about money and trade. This is what they want for our future with that freaking Euro that&apos;s destroying peoples only to help giant multinational companies. Yes, Madame Reding, there is an invasion. Mass immigration has caused countries to lose their inner identity. Whya re you so much for the freedom to go anywhere? To see countries lose their identities to weaken a sense of belonging to a nation to further encourage people to feel European. Sorry, I don&apos;t feel European more than French. I don&apos;t think Italians, Romanians, Germans are the same as French people. We do have different cultural and historical backgrounds, even if they might be similar. This is what makes the beauty of countries, you can discover and learn about others. I don&apos;t want that USE (United States of Europe) and a lot of people do not want it either.